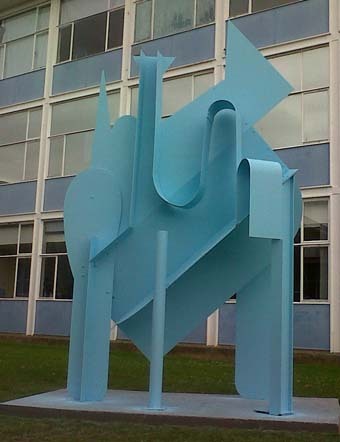 Stephen Lewis has just installed a new sculpture in the grounds of a comprehensive school in Essex. “Rare Earth”, to give it its title, is made in steel and is coloured a bright, sky blue. An adventure in planes and rhythmic curves; it stands some four metres high by two wide and one and a half deep, in the quadrangle of The Sweyne Park School in Rayleigh. The school received funding from the Royal Opera House Creative Partnerships Initiative a couple of years ago and has been able to work with artists and practitioners in various disciplines, on a number of different projects. Admirably affording pupils a rare glimpse of the creative arts “out there in the real world”. The projects have now ended and sadly the initiative has been removed from the financial horizon. The success of the project however is unquestionable, for the school and wider community have received the sculpture warmly. It is also a significant new addition to Lewis’s canon of work. The work raises some interesting questions about how artists respond to a specific site brief, and - in a profound way - how we perceive space in an artwork - in this case through three-dimensional form - and how colour can define our sense of distance. In looking at Stephen Lewis's sculpture "Rare Earth", one is immediately struck by just how close to us it appears. The work is large in human terms; yet large works can feel distant to our eyes. Here though, the colour and the scale of the component parts is such, that the sculpture feels very physical, very real, very much "there" - in generous close-up. Steel has been made pliable, soft and bendy, yet maintains its rigidity, its tensile strength. The expression is arrived at through revealing the ‘truth’ of the material used – In fact, it could not exist in the same way in any other material. From one vantage point it appears to thrust upwards, lurching like a young giraffe finding its first feet. Elsewhere, planes of steel hang in the air, open out or turn in the way an automated machine would, purposeful, precise, delicate even. The sculpture is a tale of two halves - to borrow a sporting analogy -, which are set against a central, silhouetted spine. The 'front' side is dynamic, with ribbon-like arches that create a cascading grandeur - all the more satisfying for the way this ribbon makes a subtle shift away from the central axis into suspended space, hovering around adult head-height 'abruptly' at the finish – a horizontal anchoring itself against -and contrasting with - the vertical of one of the ‘legs’. The back is lean, open and sparer in area; empty by comparison, vast in sensation - providing a telling counterpoint. In the silhouette we can notice the shapes of industry: chimney, container and tank. These are not to be seen as references as such, more as an observed "known" that draws us in and invites further enquiry. The work asks questions of our experiences, probes our own visual vocabulary bank, yet it does not pander to this knowledge or drift into theatricality or even seek a landscape style of representation. The landscape, if one could call it that, that is there, is integral to the overall form - working as an autonomous contour, which contrasts with the other shapes and forms in the work. There are many more rewarding facets that unfold as we walk around this work; we notice different thicknesses of steel in the laminated planes that support the main ‘body’ – structurally essential, but visually surprising nonetheless. There are curves, straights, tubes and angles - all of which are coolly controlled and work together to produce the overall visual poetry of the sculpture. As a card sculpture can be animated by a witty use of a fold or slot, so too, this work has a witty logic about it. It teeters on the brink of being fun, which along with its seductive blue colouring gives it a larger than life character. It is thought provoking, energetic in feel, yet sedate, almost classical in composition. It animates the space around it – which is relatively unforgiving. Sitting on a concrete base surrounded by grass in a quadrangle to one side of a connecting path, that runs through the space; it peeks over the lower rooflines and affords enticing reflections off nearby windows, in the walls of glass that surround the area. There are dialogues with the shapes of the school buildings, which include a very noticeable chimney. The location though is calculated and the rectangular base sits at a slightly oblique angle between the path and the parallel backdrop of one of the buildings, - this positioning enhances its vertical and ‘forwards’ looking dynamic. The whole ethic of this work school treats a school in the way it should be treated (especially in this day and age): as a place of learning and discovery. I cannot think of a better setting for it.